Imagine a world pre-Instagram, pre-snap-chat, pre-facebook. Go even further and think about life pre-smartphone, pre-computer, or dare I say it? PRE-INTERNET. I know you’re thinking, “How did people survive? What was that like?” Well, people survived, and the world still functioned. Technology and the Internet undoubtedly play enormous roles today, and to think often tiny devices that we hold in our palms can hold such vast power in our everyday lives. We may be a bit spoiled nowadays--as almost every question is a few finger clicks away from being discovered, every location is just behind opening your smart-phone application, and any message can be sent across the world in a matter of seconds. And with all this luxury lies extensive responsibility, because now more than ever we have a tremendous ability to change the world. We can find answers faster, solve problems quicker, and connect with people almost instantly. These influential times, with technology at the tip of our grip, are when giving back and changing the world are most accessible. It’s up to us to utilize these advanced resources we’ve quite literally been handed. Randy Schilling, the founder of BoardPaq, is doing more than just leading the way in mastering technology, but he’s also actively changing the world. Sounds like a lot of work, right? Well it doesn’t necessarily have to be. BoardPaq has partnered with Good Meets World, a service that enables businesses to give back alongside their service or product. Good Meets World helps businesses support an important cause every month, making giving simple yet effective. So, naturally BoardPaq boarded the giving train. But technology and connectedness weren’t always that simple. Randy Schilling didn’t grow up with Snapchat filters and google maps, but his career parallels some of the most monumental times in the technological realm. He graduated high school from St. Charles High in 1981, the same year International Business Machines Corporation (IBM) launched their first version of the personal computer (PC). Years later, while Schilling was graduating from the University of Missouri- Columbia with a degree in electrical engineering, IBM introduced the Token Ring local area network (LAN), a technology which allowed for these computers to be connected to a network. Schilling referred to himself as a “lazy engineer” at his first job at Illinois Power. And if the adjective lazy were interchangeable with innovative, I’d agree with him. He describes his first day-to-day role as a young engineer as constantly looking up information. Remember, back then looking up information didn’t mean whipping out your smartphone and thumbing keywords in a google search. He physically had to walk from place to place at Illinois Power in order to find the necessary information. So being the creative young engineer he was, Schilling started to plug this information into databases, and eventually built a software to store it. Then, when colleagues asked for certain information, he could look it up directly on the computer instead of running around to find it. Seems simple, right? This was just the beginning of Schilling’s career in informational technology (IT) and his multifold list of accomplishments in creating efficient concepts, software, and businesses. After his first job he was recruited by Grant Thornton in Chicago, an accounting management consulting firm, to help start an IT practice based on the technology he was using at Illinois Power. Then, in 1992 he started his first business, Quilogy. This monumental stage in Schilling’s career coincides with another significant technological era--when the World Wide Web was commercially making its debut. Quilogy took off, building large enterprise software solutions for large companies like Southwestern Bell (what we know as AT&T) and Energizer. This small company Schilling started eventually led to its sale in 2010. As technology is constantly advancing, so did Schilling’s career. Around the time Apple launched the iPad in 2010, Schilling founded BoardPaq, an application for planning, running, and managing paperless Board meetings. As Schilling is not only involved in the IT world, he is also an involved community member and sits on various boards. He observantly noticed the amount of paper used at these board meetings and the idea of BoardPaq was born. Within six months, the first version of the application was in the Apple store. From the first paying customer in 2012, BoardPaq now has over 12,000 boards & committees, with 50,000 board members and executives managing over 1.3 million documents! Needless to say, BoardPaq has grown exponentially since its first days, and continuously progresses technologically, as well as leads its industry in terms of social impact. With their giving program with Good Meets World, BoardPaq donates to and supports One Tree Planted every single month. One Tree Planted is a non-profit that works with reforestation organizations in need of financial support to help plant trees around the world. Coming full circle, what better cause to support than one that revolves around the first campaign of BoardPaq--paperless board meetings, “Save a tree, go paperless with BoardPaq.” With its giving program, BoardPaq has helped plant 3,000 trees around the world so far. A St. Charles native, Schilling owns several buildings in downtown St. Charles, including OPO Startups, a co-working center for digital startups where entrepreneurs can connect and collaborate. Just as BoardPaq supports recycling and environmental responsibility by supporting One Tree Planted, Schilling supports entrepreneurs and startups as well as the community he grew up in and currently resides. OPO Startups is located in the Old Post Office building in downtown St. Charles, which Schilling bought and renovated. He refers to the renovation as "recycling," as they chose to preserve this historic building instead of tear it down. Schilling said BoardPaq will continue to evolve with technology, as a company and a product to be better and more efficient. From a young engineer that changed the way data was obtained and to now changing the way board meetings are run, Schilling has definitely dropped several pins on the IT map. As an entrepreneur, business owner, and contributor to social impact, Schilling continues to progress while making a difference not only virtually but also in real everyday life--the life on the other side of the glass screens and tiny squared keyboards. 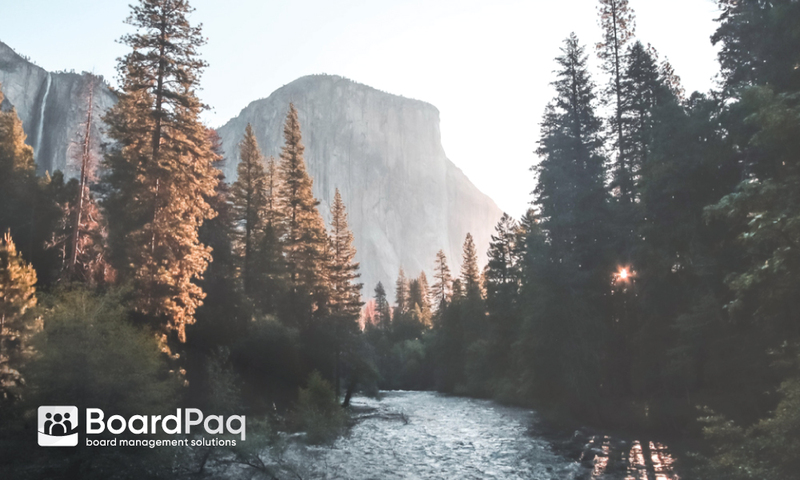 Whether its saving trees with paperless board meetings, or planting trees with its giving program, BoardPaq is doing its part as a business to help make our world a better place. BoardPaq is an affordable, easy-to-use, secure portal on iPad, Windows and Web devices for planning, running and managing paperless board, leadership and committee meetings. BoardPaq&apos;s board portal solution is used in small-medium enterprises including for-profit, nonprofit, education and government organizations.